The Globe and Mail reported the effect of forest bathing (walking in forest park) on human health based on the results conducted in Japan. 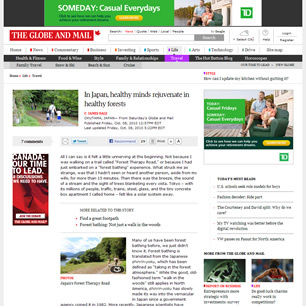 The Globe and Mail is a Canadian English language nationally distributed newspaper, based in Toronto and printed in six cities across the country. With a weekly readership of 935 000, it is Canada's largest-circulation national newspaper and second-largest daily newspaper after the Toronto Star. The Globe and Mail is widely described as Canada's newspaper of record in the English language. It is owned by CTVglobemedia.